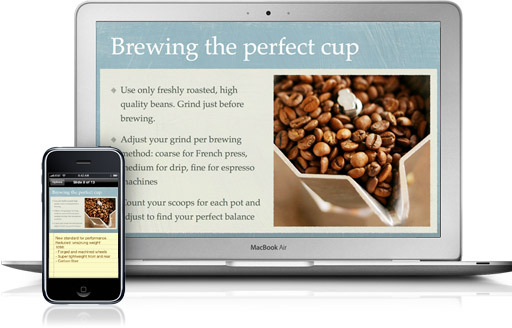 iWork '09 is Apple's latest office suite that is not only the most affordable professional package of this nature but offers users everything they need to create documents, spreadsheets and presentations and best of all, it's all Mac. As per usual, the product contains the latest versions of Pages '09, Numbers '09 and Keynote '09 and for the uninitiated, they equate to a powerful word processor, spreadsheet program and a presentation maker. For those Microsoft users thinking of making the leap to Apple, the program could be compared to Microsoft Office light with Word, Excel and PowerPoint... and yes, iWork '09 is compatible with Microsoft Office. Needless to say, this is an exclusive Mac product that has received a slight face lift and offers the users a plethora of new features, ensuring that their office experience is a flawless experience. Definitely a program to investigate if you are in the market for an affordable office suite program. The installation of iWork '09 was a breeze and on our test machine which was a iMac 20" 2.4GHz Intel Core 2 Duo, 2GB RAM and a 500MB Hard Drive. The installation successfully installed in around 8 minutes that translates to making a coffee and drinking your coffee. Once the installation was completed, we were greeted to a similar interface to iWork '08, however with a few new tweaks and improvements here and there. The Spartan like interface is perfect for this product which ensures users of all computer levels can easily access to this product. However with that said, once you enter each of the products, the features are quite powerful and is everything you need to design your own documents, spreadsheets and presentations without the necessity of outlaying huge costs. The software contains some very in-depth tutorials to assist with the usage of these programs and when in doubt, you can always visit the Apple iWork support site or online forum. Pages '09 is a word processing tool which allows users to create their own documents from letters, resumes and stories to name a few of functions that this program can do. 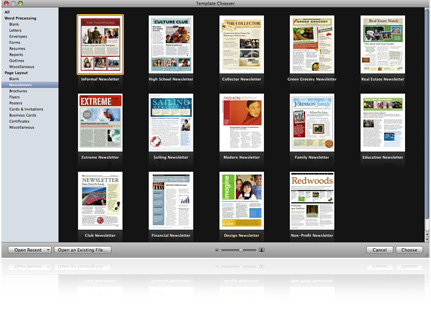 The new version of Pages '09 gives the user a variety of new templates and formatting options. The program supports EndNote X2, however this is an additional cost and is a great reference tool for students and academics. The most impressive feature of Pages '09 is the new full screen view which allows you to work full-screen and of course gives the user more workspace which is great. 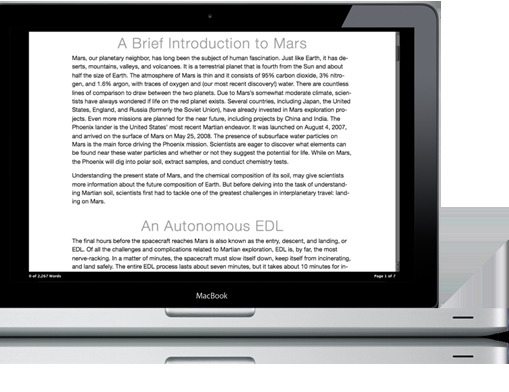 Pages '09 supports two different editing modes that include word processing or page layout, depending on what sort of documents you need to create. The program is compatible with Numbers '09 and allows you to drag tables into Pages '09 documents without losing any formatting. Of course, the program features all the standard word processing tools such as spelling checkers, thesaurus and the like. Another new feature is the Dynamic Outlines that is great for budding authors as it allows you to structure your thoughts with topics and subtopics. Match that with over 180 templates and Pages '09 is a great tool for creating cards, flyers, letters and the like. A great improvement over its predecessor, although this is nothing new from Apple. See your work without distractions. More templates. Even faster browsing. Open, save, and email Microsoft Word files. Numbers '09 is a great spreadsheet utility that is reminiscent of Microsoft's Excel which is not a bad thing as Excel can be considered one of the most definitive spreadsheet programs. This program supports all the main spreadsheet tools such as formulas, tables and charts. The most noticeable differences with this current incarnation of Numbers is the new colour coding of formulas and of course the variety of templates to give your document that professional look. For example, the "Easy Formulas" part of Numbers '09 gives you access to over 250 functions to assist with your spreadsheets that even allows you to create placeholders that make accessing your formulas a breeze. The function browser in Numbers '09 has been improved, allowing users access to a variety of functions, each with examples to assist. Of course, the new animated charts are a great aspect of Numbers '09 for small business or students. Whether you are creating 2D or 3D charts, Numbers '09 has quite a few options for the user. See every calculation in one place. Group and organize your data. Create even more impressive charts. Find the perfect template even faster. Open, save, and email Microsoft Excel files. 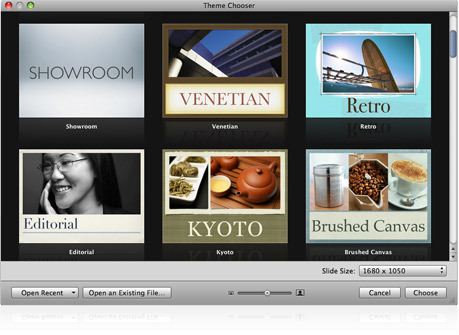 Lastly, we have Keynote '09 that is Mac's answer to PowerPoint and almost offers a similar amount of flexibility. I must admit that Keynote '09 is quite easier to use when compared to PowerPoint as it's relatively easy as 1 2 3. The program supports a large number of different templates and pre-installed graphics and animation tools to assist you with your presentations. Thanks to the new Theme Chooser, choosing a theme is quite an easy process and are quite professional. The best feature of this new incarnation of Keynote '09 is the Magic Movie tool which allows you to select text or graphics and then animated the selected area. Even better is that the animated text or graphics doesn't look "amateurish", rather quite professional. Of course, there are also a variety of new visual effects and new styles to create that impressive looking presentation. Whether you're adding audio or video, Keynote '09 has it all. For those technojunkies, Keynote '09 supports both the iPhone and iPod which means you can use these devices to control your Keynote '09 presentation. Definitely a very cool feature. Apply a captivating transition with a single click. Find the perfect theme with enhanced previews. Amaze your audience with new text and object transitions. Add movement and texture to your 3D charts. Use your iPhone or iPod touch as a controller. Email your presentation as PowerPoint or PDF. Although an affordable and powerful program suite, more advanced users may still need to rely on Microsoft Office for MAC, however for the average user, iWork '09 is the perfect software compendium for your Mac. The beauty of iWork '09 is the simplicity of creating documents, spreadsheets or presentations that truly is child's play and without the complexities of Microsoft Office and at a third of its cost, depending on which version. 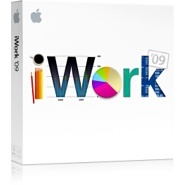 iWork ’09 makes it easy to exchange documents with anyone.